Toshiba Corporation today announced that its SCiB™ (Super Charge ion Battery) battery has been selected by Mitsubishi Motors Corporation to power two new models of electric vehicles (EV), the i-MiEV and MINICAB-MiEV. The SCiB™ is Toshiba's breakthrough rechargeable lithium-ion battery that combines high levels of safety with a long life, rapid charging and excellent charging and output at very low temperatures, characteristics that make it highly suited to application in EV. Toshiba developed the SCiB™ to meet a series of demanding performance and safety criteria. By successfully employing lithium titanate oxide in the anode, Toshiba has assured that the SCiB™ offers high level operating safety, a long life and rapid charging. The use of lithium titanate oxide also significantly reduces the possibility of a puncture in the separator between the anode and cathode, so minimizing the risk of them coming contact into and short circuiting, and maintains battery performance levels even in severe operating conditions, including very low temperatures. The SCiB™ pushes the life of the lithium-ion battery to a new level by supporting 2.5 times more charge/discharge cycles than a typical lithium-ion battery. Recharging is also notably better. Charged with the highest current available with CHAdeMO*1, widely seen as the emerging standard for fast charging EV, an SCiB™ reaches about 80 percent of full capacity in some 15 minutes, about 50% in 10 minutes and about 25% in 5 minutes*2 – half the times of a typical lithium-ion battery charged under the same conditions. The SCiB™ also generates little heat while recharging, eliminating the need for power to cool the battery module. Most important of all for real-world application, the SCiB™ delivers high level performance. The SCiB™ offers a higher effective capacity than a typical lithium-ion battery, in that more of the stored charge can be used safely before recharging the battery. This, combined with highly efficient regenerative charging during braking or coasting downhill, allows the SCiB™ to deliver 1.7 times the driving distance per level of charge of a typical lithium-ion battery. This will allow for installation of smaller battery modules in vehicles and contribute to lower EV prices. The SCiB™ also offers high level performance in a wide range of temperatures, and continues to support rapid charging and excellent power output at temperatures as low as -30ºC. The SCiB™ for Mitsubishi's new EV will be manufactured at Toshiba's Kashiwazaki Operations in Niigata prefecture, northwest Japan, a new facility dedicated to production of SCiB™ that came on line in February this year. Toshiba will seek to establish a plant operating structure able to respond quickly to market growth as the basis for expanding the SCiB™ business for EV, including hybrid and plug-in hybrid EVs. As the automotive industry responds to concerns about global warming by developing a new generation of environmentally friendly EV, Toshiba is promoting advances in essential automotive technologies, from dedicated on-board control systems to batteries and Intelligent Traffic Systems. In automotive-related power electronics technologies, Toshiba is targeting net sales of 800 billion yen by fiscal year 2015 from its concentration on motors, inverters and SCiB™. 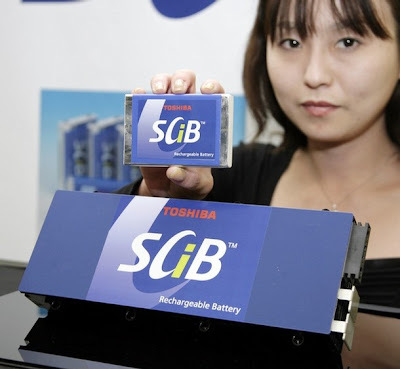 Toshiba will continue to promote sales of the SCiB™ in a global market for lithium-ion batteries that is expected to record sales of some 1 trillion*3 yen in fiscal year 2015. *1 The CHAdeMo Association is promoting a global standard for fast charging of EV. *2 For a battery with a capacity 10kWh.